I grew up reading what we in my family called "the white books". 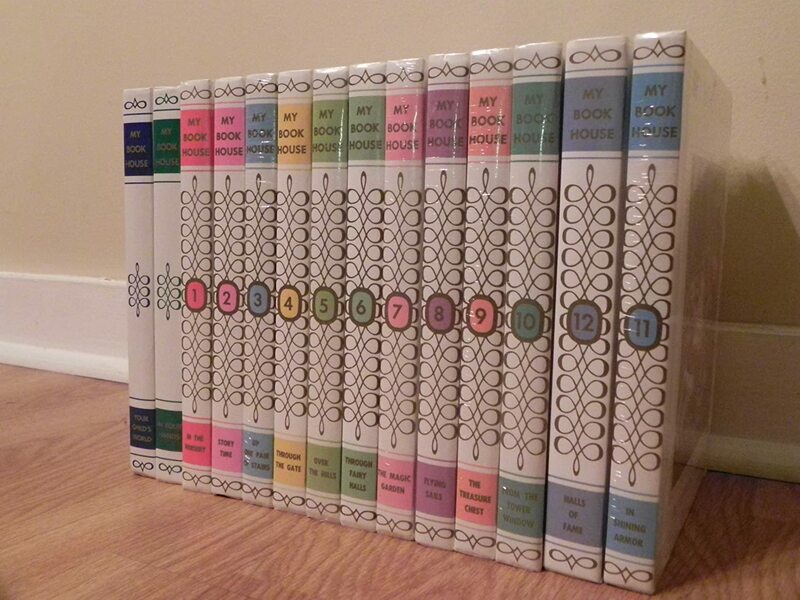 They are really a set of books called "My Book House". I had fond memories of reading them (at least volumes 1-4). Unfortunately, when my siblings and I grew up, my older brother who got married and had kids first somehow claimed them as a birthright or something and I was a little ticked off. Well, fast forward nearly 8 years and I've still only read in books 1-4. Isn't that silly? I've been trying to declutter, especially our bookshelves and am trying to keep only the books I love and have finally come to the conclusion that I need to get rid of books 5-12. I'd sell them, but they're not worth much. Then, while I was flipping through the books I came across some of the color artwork and realized, "This stuff is quite stunning!" Then I thought maybe I could cut the artwork out and frame them. I mean, seriously, I will probably never read the books and they're just sitting there. So my dilemma is... should I destroy books 5-12 to save the lovely artwork and appreciate it or keep the set intact and donate it instead? It's a serious decision because I have learned the hard way that you don't just rush headlong into destroying a book you think you need for a "project" because chances are you might later regret it. Any opinions out there? This is a dilemma indeed! I think I remember these books! And how thrilled you were when you found them! I really hate to think of you getting rid of them all, and I'm going to be shocking and suggest using the others for the lovely artwork. It's almost sacrilegious, but sometimes it has to be done. That's my two cents! Are You Smarter Than An Eighth-Grader...?